The family of Mathieu Lefevre has filed a lawsuit against the NYPD for refusing to release information related to the hit-and-run collision that killed the 30-year-old Brooklyn cyclist last October. According to the complaint, filed in New York State Supreme Court on December 30 , NYPD denied a freedom of information request from Lefevre’s parents seeking records pertaining to the crash, on the grounds that the investigation is ongoing. The Lefevres appealed, citing their belief that the records in question are not exempt from disclosure under the law. NYPD failed to respond, effectively denying the appeal. NYPD routinely denies access to information on deadly crashes, often based on the claim that releasing even the most rudimentary details would jeopardize crash investigations. The Lefevre lawsuit challenges that practice, based in part on the fact that NYPD has declared that no charges will be filed for Mathieu’s death. 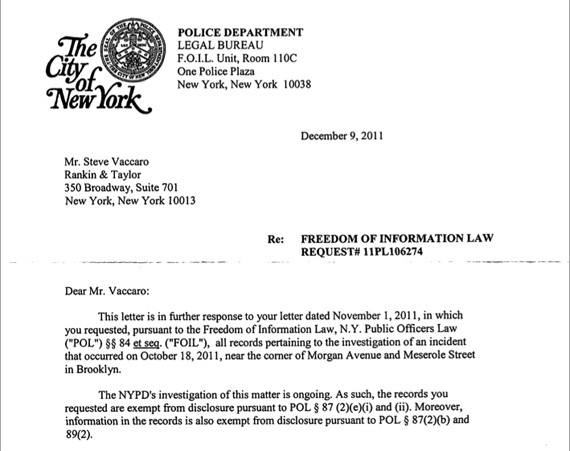 NYPD admits that it possesses records requested by the Lefevres, but has stonewalled for nearly two months, refusing to disclose those records without a valid justification. The two grounds advanced by NYPD for withholding the records are completely lacking in merit. First, NYPD asserts that it can withhold all records concerning Lefevre’s death, so long as its investigation of his death is still open. That is incorrect. FOIL exempts from disclosure only records the release of which would interfere with an ongoing investigation. NYPD does not suggest even the possibility of such interference. Second, NYPD asserts that release of records concerning Lefevre’s death would jeopardize an impartial trial or adjudication. But NYPD has already announced there will be no criminal charges related to Lefevre’s death. Absent criminal charges, there is no right to a trial by jury, and therefore no chance of a tainted adjudication.